I’ve tried a veggie version in Hawaii and love it, will have to keep an eye out for this version the next time I go home. Thanks for sharing! Ah, I ate these all the time when I worked around the corner from a Vietnamese restaurant… they’re very good! Perhaps I’ll just have to try your recipe some time. Thank you! Just in the nick of time. I off to Seattle shortly for book tour and was searching for some new places to try. I didn’t get to Salumi when I was there last December, so it was already on my list. Now I look forward to Banh Mi as well. Good thing I have several days in the city, so I don’t have to force feed myself. Congrats on plowing through both sandwiches! and thanks for a recipe as well. Wow. That Bahn Mi looks amazing — far superior to versions I’ve had here in NYC. And having had the great good fortune to have eaten a porchetta sandwich from Salumi last June, I salute your capacity. It looks and sounds as if it was all worth the tummy-ache. What a great post today….this looks delicious and a different version at that! Thanks for sharing ! That looks like a serious sandwich– I feel the urge to run straight to chinatown and get the necessary ingredients. Or I’ll just hop on a plane and make haste to your house for some leftovers. If there are any. I admire your sandwich eating capabilities while in Seattle–it is hard when you go away and have only a short amount of time to explore the food– a belly can only take so much. You did good! wow. That´s some restraint. When I´m travelling, I go crazy with frustration at not being able to try everything. Ideally, we´d be like camels, but o well. I´ve had a recipe for chinese barbecued pork flagged for months now, you´ve made me want to make it now, today, this minute. I discovered Salumi about 3-4 years ago, a good friend who knows Armandino recommended the place. Did you know he also does private dinners that are by invitaiton only and booked up to a year in advance. I was lucky enough to go to a 14 course dinner there. When I took the hubby there he was happy with his coppa and porchetta sandwich.The Vietnamese place used to be called Bu Dien I think and I used to go there too. Why can’t I find one of those in Torino. I would die for one right now. Esp. the ones with Veitnamese salami and chilis. What a great story! And it’s comforting to know you are on my lunch schedule now! Hehehehe. Glutton? Who me?I am fortunate enough to live in the largest Vietnamese community outside of Vietnam, right here in So Cal. I have a weak spot in my heart for these sandwiches and now I think I might actually give it a try in the kitchen. Thanks,M! Oh sure, I needed another sandwich to covet. I loved your story, particularly since I had my first banh mi last week, and as I drove away from the little market and took my first bite, all I could think was "Omigod! Why didn’t I buy two!" Anyway, I have been researching the heck out of banh mi for a long time now, way before I had my first taste, because I just knew it was or me. I have been trying to find a recipe for the bread, as there are no Vietnamese bakeries in the area. but the only one out there is from Corrine Trang’s book, and from what I have read online, the proportions of rice to wheat flour may be off. Does anyone know of anyone who has perfected making these baguettes with ingredients found in the states? I’m getting desperate, as I am convinced that a regular French baguette would ruin the whole experience. 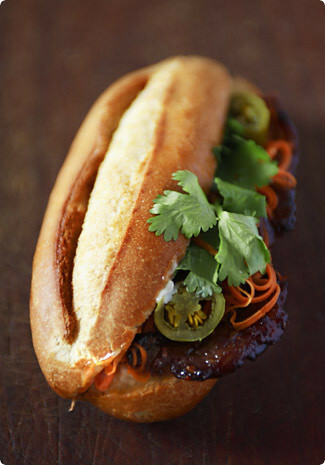 yumyumyum, i’ve had banh mi once and been dreaming of it since. awesome post, i remember the sandwich was so BIG too and the sweet pork. great job loks wonderful! Thank you for sharing the recipe. I only tried this recently and wow- what a perfect sandwich. I plan on making it very very soon!! Oh yum. The best banh mi I have ever had was from a small stall in front of the central market in Hoi An, They used both pork pate and braised belly pork. Then they covered that with the freshest veggies and a lovely spicy sauce. I can’t tell you just how amazing those were. In the few days we were there, I think I ate at least 1 or 2 a day. They were that good. Wonderful storytelling, and the luscious sandwich looks absolutely worth the wait. We’ve had banh mi in Vietnam, where we could never figure out how to order any filling except the pork sausage-y filling, which wasn’t too appealing to us. One thing that was a surprise was how wonderful the French bread in Vietnam could be — a tradition left behind when the French pulled out. I am so happy to find out about the Seattle Deli. Last time I was in Seattle I almost cried when I found out that Salumi would be closed the two days we were going to be there. It’ll be nice to have another option. Until then, I will try them again at home with your recipe. I have tried making the rice flour baguettes before without much success so if anyone has tips, please share. I LOVE Bahn Mi! But, I haven’t tried Seattle Deli yet. The little place in the Uwajimaya (the ID supermarket) food court is also quite good, although just about as hectic. I’ll have to give Seattle Deli a try. As for Salumi, I know I’ll sound like a heritic, but I’m fairly mild on the cafe. There meats are delicious, but I had a mediocore experience with the bread… and blah bread just ruins a sandwhich for me. Just a note to those going – make sure that you know what bread your sandwhich is on, or you may be very disappointed. Darn! I was in Seattle last week and didn’t know to try those famed sandwich shops. Oh well, plenty of banh mi shops in Vancouver, however. I love the ones made with Vietnamese cold cuts and pate. My boyfriend loves the bbq pork version. It’s those pickles that make it so juicy and delish! Can’t wait to try your recipe… tonight! Your story made me laugh! Oh my god.. Bahn Mi was my favourite food when i was in vietnam, and i didnt even figure out what it was called until i got back home. Everyone just called it a baguette. My favourite ones were found in Saigon. for 50 cents. i think the secret is the cream cheese, not mayo.. they use the laughing cow brand cream cheese, homemade pate, ham meat, pickled carrot and radish, sliced chillis, cucumber, cilantro.. I missed it so much when i came home, i tried to replicate it, a little hard since i really didnt want to make pate. but i found plain pork sausages and boiled and sliced them. the pickles are the best part though.. carrot and radish julienned, pickled with rice wine vinegar and sugar. the version you got is the more fancy one i expect. but the simple one is so great. sigh.. i want roadside bahn mi from the lady in the conical hat! Hi!you described so well your tour in Seattle that I imagined to be there! !nice dishes! I tried this recipe last night, with a few minor modifications due to availability of ingredients, and it was fantastic! I tried my hand at making some banh mi at home when the vietnamese place that sold them in the street in out Strip District closed up. I did mine with some pate, from a magazine recipe. While they were good, they just did not measure up to the street food, and I haven’t tried making them again. I kind of felt as if they lost some of their casual charm when I fussed over them…but when I didn’t fuss, they didn’t taste right to me.Whenever I get a chance, I buy them from a street vendor, though. I love them and rank them among the world’s best sandwiches. Right up there with BLTs and cuban sandwiches and Reubans.Yours are considerably prettier than mine were.They look delicious. I loved this post! I felt like I could see you in that crowded little store. I’m impressed that you recreated banh mi at home so faithfully – that sandwich is absolutely gorgeous! Now we know what’s for dinner on Sunday… provided I can find all of the ingredients.Just, yum. Being Vietnamese and living in the Bay Area, I am fortunate enough to get one of those banh mi whenever I want to. My favorite is the bbq chicken with creamy butter sauce. If you get a chance to visit California, be sure to put it on your "to try" list. I promise you will not be disappointed. Great recipe Melissa! I tried it yesterday and it worked really well. Couldn’t find any daikon though. Have you seen it on sale anywhere in Edinburgh? Oh, oh, oh do I have another lunch venture for you, and in Seattle no less! I had to peruse your post just to see if indeed you had been to The Bagette Box, and their infamous Drunken Chicken Bagette Sandwich. Holy smokes, I actually arrange errands and create cross-town paths around the lunch hour just so I have an excuse to be in the vacinity of this divine sandwich. I usually hide in my car to devour in large bites, leaving my manners teatering on the curb. Put it on your lunch list for your next Seattle venture! Bánh Mì Thit Nuong is always awesome! I have enjoyed these sandwiches here in Pittsburgh, probably from the same source that Lindy mentions, but I didn’t know that they had closed (sob!). I also didn’t know the proper name of the sandwich – I think the lady who sold them called them "Vietnamese hoagies", which is pretty descriptive. I agree, addictively delicious; the saltiness, the sweetness, the spiciness, the roastiness, yum! Yay, banh mi! I miss these so much here in Beijing. I practically grew up on the pho and combination ham (i hear you: pate, mayo, pickles, cilantro and mystery cold cuts!) banh mi from the Little Paris on Clement St., SF and was horrified when their lease wasn’t renewed a couple of years ago (they had the best Imperial Rolls ever). The banh mis out in the Tenderloin are fantastic, though, and I used to drag my mother out to the "shady neighborhood" for my sandwich — it wasn’t hard after I split a BBQ beef banh mi with her! Mrs. B – Glad to come to the rescue. I hope you’ll give us the full report on your lunchtime escapades when you get back!Julie – That porchetta sandwich is a monster, isn’t it? Normally that would please me to no end, but it certainly doesn’t make multiple lunches very easy…David – Well, see, there you go – in my beginner’s ignorance I didn’t even know there was jarred char siu sauce. And although the Libra element wouldn’t stop me from buying anything in a jar, it would potentially prevent me from purchasing one in case they sold more than one brand, as I simply wouldn’t be able to decide which one looked best…Austin – You’d think being a linguist and all I would be able to tell the difference… sigh. Anyway, thanks for your take on the authenticity – I guess I’ll just have to get myself to Vietnam to find out what they actuall do over there (and while I’m at it, pick up a Vietnamese newspaper or two to add to my prop collection).Gia – Wow, can you fell the envy seeping through the screen? I mean, I didn’t try anything but the porchetta, but if that is anything to go by I imagine you had one heck of a meal!L – Do check out the Seattle Deli. I’m curious to know how it compares to other places in the ID. And as for the bread at Salumi, the day I was there they were using two types, a softer round one for salami sandwiches (which I didn’t try) and a coarse baguette for the porchetta and meatball which was very good, albeit quite a jaw workout!Margaret and Dharshi – Fantastic, so glad you liked them!Claire – Do you have any specific locations you could recommend? I’ll keep them safely tucked away until next time I make it to the Bay Area.Janelle – Sounds like my kind of sandwich. It is now on the ‘next trip to Seattle’ list! Hey there! I’m late joining the bahn mi party, but I love the commentary and I was wondering is it a huge "NO-NO" to order a sandwich without cilantro? Or do you request parsley or basil instead?Thanks, Laurel R.
actually i’ve never tried bahn mi before, but now knowing in seattle there’s seattle deli to buy this, next time i’m there i’ll be ready to try it. thanks for the info! Molly – I don’t know if you’ve been to the Seattle Deli yet, but I’d love your take on how it compares to other places in the ID. I suspect there is a veritable banh mi blowout in our not-too-far-distant future, and the more prepared we are, the better!Laurel – While I can’t say I know enough yet about banh mi etiquette to give you a definitive answer on cilantro inclusion, if my experience is anything to go by it should be very easy to remove after the fact (on my sandwich, for example, it was just one long sprig). As for requesting basil or some other herb…it certainly can’t hurt to ask :)Eliza – If you’re a fan of Vietnamese food, do plan to spend some time in this part of Seattle next time you go. They don’t call it Little Saigon for nothing! I have been eating these for years. My Chinese/Burmese sister in law introduced them to mw and calls them "little asian sandwiches". Now I know they have a name. Ahhhhhh…so very delicious. I have only recently discovered the Banh Mi, and though I don’t normally do the old blog thing, I felt I had to mention a wonderful vietnamese bakery in Sydney Australia. It’s called ‘The Little Devil’ and is only a tiny place on Broadway (near the corner of City Road). It has odd little signs hanging from the ceiling with pictures of baby-like red devils (obviously) and saying things like ‘I love The Little Devil!’. They have the most delicious Banh Mi’s – just called pork roll, chicken roll and meatball roll. About $3.50 each I think. Superb. If any of you guys are ever in Sydney you should check out The Little Devil! i live in houston and we’ve got a pretty prominant part of town heavily infused with vietnamese culture (from the street signs to the dozens of pho and banh mi restaurants that dot two major streets called bellaire and westheimer). there’s one place, hidden behind a few more prominent buildings, called "givral" where the have, hands down, the best pork banh mi i’ve had anywhere. it’s sweet, salty, tender, and the carrots, jalapenos, and cilantro are so bright, crisp, and consistently fresh that this place is a staple for those who went to school in the area. what this comment is really about though is the spread that they used, which didn’t seem to be mayonaisse. the best rendition we could come up with is mixing homemade mayo with bacon fat, some sugar, salt, white pepper, and butter. it sounds extremely unhealthy, but what it lacks in proper nutritional value is makes up for a thousand times in taste. you might want to try it out and see if it adds any dimension of flavor to what looks like an already mouth-watering version of the sandwich. keep up the good work! Hi Melissa, I know this is a much older post – but I found it on your Recipe Index. Bánh mì is my favorite sandwich and I thoroughly enjoyed reading your post. Despite my ADD, your writing keeps me enthralled to the very end. I live in an area where no Viet delis or bakeries exist and I’ve found that French or western-style baguettes are not suitable for bánh mì – they’re too dense and hearty. Mexican bolillo rolls, though, are the closest thing to Viet bread that I’ve found. When I went back to Viet Nam recently, I actually got to see how they make the Vietnamese baguette. It was incredible. Can you imagine – they used eggs to make the dough! Hopefully, I’ll get around to posting the recipe on my blog.